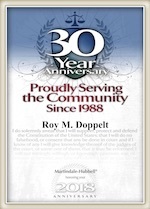 The Law Office of Doppelt and Forney, APLC is a full-service law firm specializing in divorce, legal separation and paternity cases. Call today to schedule a free consultation at our office, conveniently located off the I-15 in Rancho Bernardo. If you choose to retain an attorney, we will help you through every step in the often confusing and emotional process. We will assist with your preliminary declaration of disclosures including the schedule of assets and debts and income and expense declaration. We will prepare all pleadings. Our attorneys have over 50 years of combined experience, and will fight for your best interests in regard to child custody, child support, spousal support, division of assets and debts, and more. To find out how our divorce lawyers can help you, call today to schedule a free consultation. Automatic Temporary Restraining Orders (ATROS) are mutual Orders that become immediately effective upon service of a summons issued in a dissolution, legal separation, nullity or paternity action. There is no need for either spouse to actually request these restraining orders, because they are automatic. ATROS remain in effect until a final judgement is entered, the petition is dismissed, or there is a Court Order for termination. 1. Restrain both parties from removing the minor child or children from the state, or from applying for a new or replacement passport for the minor child/children without the prior written consent of the other party or an order from the Court. 2. Restrain both parties from transferring, encumbering, hypothecating, concealing, or in any way disposing of any property, real or personal, whether community, quasi-community, or separate, without the written consent of the other party or an order of the court, except in the usual course of business or for the necessities of life, and requiring each party to notify the other party of any proposed extraordinary expenditures at least five business days before incurring those expenditures and to account to the Court for all extraordinary expenditures made after service of the summons on that party. Notwithstanding the foregoing, nothing in the restraining order shall preclude a party from using community property, quasi-community property, or the party’s own separate property to pay reasonable attorney’s fees and costs in order to retain legal counsel in the proceeding. A party who uses community property or quasi-community property to pay his or her attorney’s retainer for fees and costs under this provision shall account to the community for the use of the property. A party who uses other property that is subsequently determined to be the separate property of the other party to pay his or her attorney’s retainer for fees and costs under this provision shall account to the other party for the use of the property. 3. Restrain both parties from cashing, borrowing against, cancelling, transferring, disposing of, or changing the beneficiaries of any insurance or other coverage, including life, health, automobile and disability, held for the benefit of the parties and their child or children for whom support may be ordered. 4. Restrain both parties from creating a nonprobate transfer or modifying a nonprobate transfer in a manner that affects the disposition of property subject to the transfer, without the written consent of the other party or an order of the Court. While terms like “restraining order” might sound scary, they don’t have to be. With an experienced attorney by your side, you can be confident your rights are being protected and your best interests are being looked out for. Call today to schedule a free consultation with a seasoned divorce lawyer. We proudly serve clients in San Diego and surrounding communities, including Chula Vista, Coronado, Carlsbad, Encinitas, La Jolla, Oceanside, Ramona, San Marcos and Vista.